Ejection seats must work perfectly every time they are used in an enormously wide range of altitudes, aircraft motion profiles, wind conditions and pilot weights while at the same time taking manufacturing variation into account. 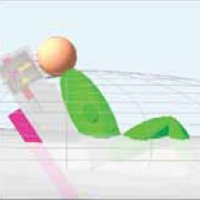 Physical testing of course plays a pivotal role in ejection seat design but time, cost and safety limit the number of situations that can be tested to far fewer than the number of potential ejection scenarios. Analysts at the Naval Surface Warfare Center (NSWC) at Indian Head, Maryland, and the 45th Space Wing at Patrick Air Force Base, Florida, have developed a model of an ejection seat using MSC Adams rigid body simulation software. During the model’s initial 5-year joint-force development process, Adams was the first professional dynamics software used to completely model the complex physics involved in the deployment of an ejection seat. Improve ejection performance and safety. Adams was used to model the complex physics involved in the deployment of an ejection seat.